BEDFORD FALLS is a half-brother to the highly successful HARLAN’S HOLIDAY, sire of Grade 1 winner and leading sire INTO MISCHIEF and Champion 2-Year-Old Male SHANGHAI BOBBY. BEDFORD FALLS sold for $1.1 million as a Keeneland yearling. BEDFORD FALLS was a Belmont Park maiden special winner by three-plus lengths. BEDFORD FALLS $57,000 lifetime average earnings per starter. BEDFORD FALLS sire of 2017 SW CUDDLE ALERT ($391,514), third to Champion Female Sprinter UNIQUE BELLA in Santa Anita’s L.A. Woman Stakes (G3), and already a three-time stakes runner-up at Santa Anita in 2018. BEDFORD FALLS also sire of Wonderful Lie ($323,924, 2nd Melair S, Fleet Treat S, 2018), Zuzu’s Petals ($257,746, 2017), Onemoresweetkiss ($179,280, 2018), Run Sophia Run ($157,785, 2018). (AQU, $180,000), etc. ), Smokey Glacken ($656,960, Distaff Breeders' Cup H.
CHRISTMAS IN AIKEN, by Affirmed. 2 wins at 3, $31,628. Sister to Bandito Barney. S.-R (TDN, $24,000), Hoover S.-R (RD, $24,000), etc. Sire. Many Rivers (c. by Storm Cat). Winner at 2 and 3, $72,506, 3rd Gold Rush S.
Bedford Falls (c. by Forestry). See below. Brother Bob (c. by Royal Roberto). 3 wins, 2 to 6, $98,017. Water Poppins (f. by Storm Cat). Winner at 3 in Japan, $60,938 (USA$). Queen of Races (f. by Henrythenavigator). Placed at 2. 3rd Sky Classic S. [G2] (WO, $27,500(CAN)), etc. Letthetigerparty (f. by Hold That Tiger). 5 wins, 3 to 5, $104,655. Ms Media (f. by Media Starguest (IRE)). 3 wins at 3 and 5, $57,051. Riddles and Rhymes (g. by Runaway Groom). Winner at 4, $49,755. No Need to Know (g. by Trempolino). Winner at 3, $21,120. S.-R (AP, $7,733), 3rd Don Leon S. [L] (HAW, $5,709), Turfway Prevue S.
$45,000), Kentucky Downs Turf Dash S. (KD, $29,760), Kelly's Landing S.
Lord of Greatness (c. by Greatness). 18 wins, 2 to 10, $591,327(USA). Big Hearted (g. by Cat Thief). 11 wins, 2 to 6, $87,909. Pokpung Jilju (c. by Greatness). 8 wins at 3 and 4 in Republic of Korea. Christmas in Aiken (f. by Affirmed). See above. Option Tony (g. by Royal Roberto). 3 wins, 2 to 7, $57,334. Strawberry Sky (f. by Skywalker). 6 wins at 3 and 4, $79,289. 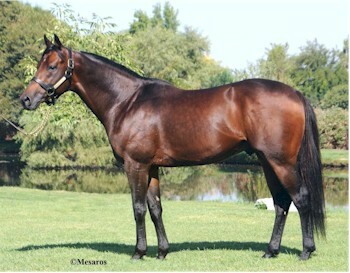 Blueberry Patch (c. by American Chance). 3 wins at 3 and 4, $53,976. Patch O'Honor (c. by Patton). 2 wins at 3, $38,924. Linkager (g. by Linkage). Winner at 3, $14,121. Boss Clay (c. by Royal Roberto). Winner at 3, $10,500. Mystical Caper (f. by Town Caper). 3 wins at 3 and 4, $72,800. Producer. Mystic Cat (f. by Mountain Cat). 3 wins at 3 and 4, $14,480. wins, 4 times 2nd, 4 times 3rd. Earned $115,620.